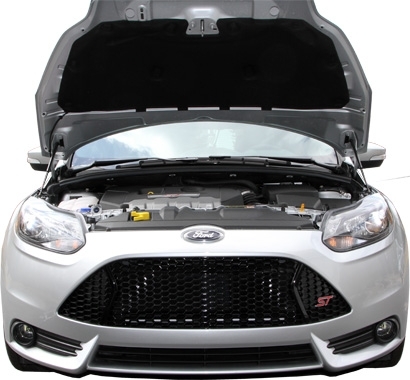 Replace your hood's prop rod today with our Redline Tuning Hood QuickLIFT system. There are always areas that every OEM doesn't address due to cost, and our high-quality hood QuickLIFT system is one of them... Two gas-springs that lift and hold your hood without the need for a poorly placed prop-rod, simply start to lift your hood and let our QuickLIFT system take over. Your hood will lift and hold firmly at the raised position - no wind or bumping will knock it down on your head. 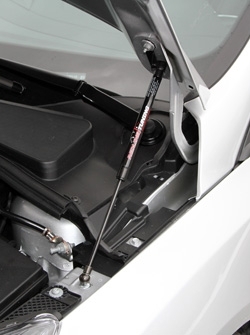 Simple one-handed operation, simply start to lift the hood and it will raise to the stock height unassisted in a smooth and controlled motion. Progressive gas springs. Our springs are not off the shelf parts, they are designed by us and manufactured to our specifications for each vehicle application. Our exclusive end-of-force dampening slows the rate of extension over the final inches of travel eliminating stress to the hood. QuickLIFT systems work with any hood (steel, fiberglass, SMC, carbon fiber etc.) - we design our systems using the stock hood so the main market is covered, however, our systems are made to work with all aftermarket hoods. Quick and simple installation - we design the systems and write all of our own documentation. FULL COLOR manuals will arrive that will walk ANYONE through this simple installation - our customer comes first. 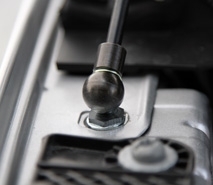 Five minute installation can be expected for the full bolt-in systems. You do NOT need to be a mechanic or car nut like us - we are so confident in our product that we post every installation manual on our website for you to review prior to ordering. 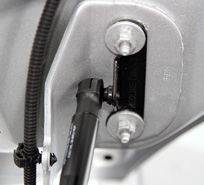 Mounting hardware - (black powder-coated for QuickLIFT PLUS) - QuickLIFT PLUS is our all-black system. Full Color Manual - Best in the industry including step-by-step instructions with detailed photos.